Sydney (AFP) – Ancient penguin droppings and the impact of global warming on the Antarctic food chain will be the focus of Australia’s latest scientific mission to the icy continent which departed Tuesday.The icebreaker Aurora Australis set off from Hobart with a research team and some 600 tonnes of cargo for its annual mission this Antarctic summer, which typically runs from October through to April. Researchers from the government’s Australian Antarctic Division said they would have two major focuses, exploring the historical feeding habits of Adelie penguins and impacts of ocean acidification on phytoplankton and bacteria, the smallest building blocks of the southern continent’s ecosystem. Seabird expert Barbara Wienecke will lead an archaelogical survey of abandoned penguin sites, excavating ancient droppings to determine how their diets have changed over time and what implications that could have for the management of Southern Ocean fisheries. “We will be digging down into the old soils formed from bird waste and looking for the remains of prey, such as fish ear-bones and squid beaks,” said Wienecke. 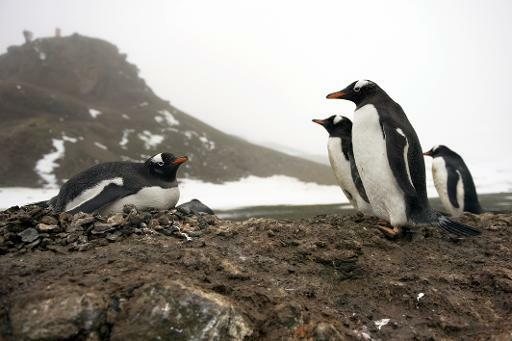 “It is the first time this type of work has been done in the Davis region and we are hopeful of finding out whether Adelie diets changed in the past, for example, from krill to fish-based diets,” she added. A microbial biology team, led by Andrew Davidson, will explore the effects of growing ocean acidification on microbes, across six 650-litre tanks called “minicosms” which will model different carbon dioxide concentrations. “Microbes are the base of the marine food web, directly or indirectly supporting all life in the Southern Ocean. They also drive the ‘biological pump’, the process by which marine life transfers CO2 from the atmosphere to the deep ocean,” he said. The Aurora Australis resupplies both Australian and foreign bases in Antarctica during the summer, doing about five restocking runs before the thick sea ice becomes impassable. Australia has three Antarctic bases — Davis, Casey and Mawson — as well as a sub-Antarctic station at Macquarie Island.